Adam and Edge in São Paulo with Cat Deeley, part of next week's TV special, 'U2 At The BBC'. The programme features the band performing at Abbey Road Studios in London, complete with choir and orchestra - including this very fine version of 'All I Want Is You'. Also a big fan of the vinyl...still have my collection from over 30 years ago...love the SOI and SOE vinyl sets which i purchased and admire...colors are an amazingly different concept...but i must say i finally received my Joshua Tree gift and omg Just brilliant...the past and present pics on each side...just love it!! !...thank you...was well worth the wait!!! Incredibly dreamed, epic, full of passion. It reaches my soul, there in the deepest. The decades pass and U2 is still U2, the best band in the universe. That was a great show, the performance of Love is Bigger than... at the end just had me in tears remembering so much of the journey. Brilliant. Great show. The orchestrations and choir worked really well. Does anyone know how many tracks they actually played? All I want is you was cut from the airing. Would love the full show as a fan club gift? Thanks for this Christmas gift, U2! This broadcast brought me to a place of great HOPE as the season and year comes to ends as well as tears and smiles throughout! I feel like a pool of melted butter on the floor after viewing it today! 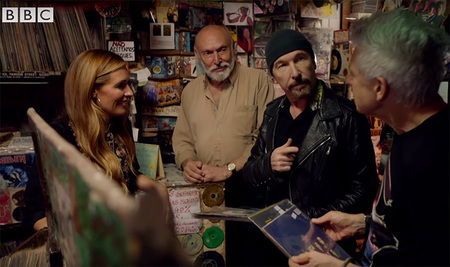 Bravo, U2 and everyone involved in the making of U2 At The BBC! I've been a fan for 30 years. At the end of the rattle and hum tour the band said they needed to go away and reinvent themselves. They did that in spectacular fashion. I think they need to do that again! So generic :( very disappointed. Edge is pretty ageless though! Fantastic to hear old and new favourites played with an orchestra...who would've thought....it added so much more to already great music that U2 do so brilliantly...and Bono's vocals holding up against them well...loving the choir in some songs ...so lovely to hear vocals from both melding so well..
Great fun, thanks! And Adam, so cool. we were expecting you to! Nice to see Sean Connery working behind the record shop counter, retirement plan going well! Love is bigger then anything in its way . Kicked back in my u2 shirt playing this song like to hear it live what you think ? like old bookstore's... there is a smell of a sort of ,well.. you name it. i feel at home. The trailer looks amazing. Cannot wait. We need a weekly Adam / Edge video.. shopping for clothes, guitars... They’re a great double act. Please make it happen.